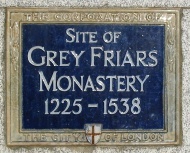 In London, the Greyfriars was a monastic establishment that existed from 1225 to 1538 on a site at the North-East of the City of London by Newgate. The establishment included a conventual church that was one of the largest in London; a studium or regional university; and an extensive library of logical and theological texts. It was an intellectual centre of the early fourteenth century, rivalling only Oxford university in importance. Members of the community included William of Ockham, Walter Chatton and Adam Wodeham. It flourished in the fourteenth and fifteenth century, but was dissolved in 1538 at the instigation of Henry VIII. 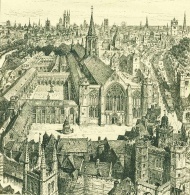 Christ's Hospital, and Christ Church (by Christopher Wren) were later built on its site. The building currently standing on the site is currently occupied by Merrill Lynch International. It was named after the Franciscans' practice of wearing grey habits. The Friars Minor first arrived in England in September 1224, on the Tuesday after The Nativity of the Blessed Virgin. They settled in London in the summer of 1225, after John Iwyn, a wealthy businessman, bought a plot of land for them in 'Stinking Lane' near Newgate, in the parish of St. Nicholas in the Shambles (butchers' quarter). The land was just inside the city wall, which at that time was next to open country. In 1229 King Henry III gave the Minorite Friars of London oak to build their house. By 1243 there were eighty friars in residence, and by 1258 they had extended the site on the North and West side. The original church was built with money provided by William Joyner, (mayor of London in 1239), who built the chapel and also gave two hundred pounds towards the cost of other buildings. Further work began on the church towards the end of the 13th century. Henry le Waleys (d. 1302), another mayor of London, is supposed to have built the nave, and given timber for the altars. It was completed in 1348. It was in the gothic style and was the second-largest in medieval London, measuring Template:Convert long by Template:Convert across. It had at least 11 altars. Benefactors included Marguerite of France, second wife of King Edward I. It became a favourite burial place for those of high rank and status. Marguerite was buried there, as was Isabella, widow of Edward II; the heart of Eleanor of Provence, wife of Henry III, was buried there as well. The monastery was dissolved in 1538 by Thomas Chapman, an agent of Thomas Cromwell. On 12th of November the house signed a deed of surrender, probably composed by Chapman. The Friars were made to confess that the perfection of Christian does not consist in "weryng of a grey cootte, disgeasing our selffe aftyr straunge fassions, dokynge [ducking], nodyngs and bekynge, in gurdyng [girding] our selffes wythe a gurdle full of knots, and other like Papisticall ceremonyes". After the Surrender some of the houses on the site were converted for private use, and the church was closed, and used as a store-house for treasure looted from the French. In 1547, the king gave the church, the buildings called "le Fratrye," "le Librarye," "le Dorter," and "le Chapterhouse," and the ground called "le Great Cloyster," and "le Little Cloyster" to the City of London. The church, now called Christ Church was to be church of a new parish formed by joining St. Nicholas and St. Ewen. It was re-opened on 30th January, 1547. It was destroyed by the Great Fire of London in 1666. Christ's Hospital ('Blue Coat School') was founded for orphans in some of the old friary buildings in 1553 by Edward VI. Leland, "List of manuscripts in the Library of the Grey Friars", Collectanea, iv., 49–51. King Edward Street North out of Newgate Street, at No. 82 to Little Britain (P.O. Directory). In Aldersgate Ward and Farringdon Ward Within. So named 1843. Former names : "Stinking lane" or "Chicke lane" (S. 318). "Stinkendelane," 1285 (MS. D. and C. St. Paul's, Lib. L. fo. 93). "Stukande lane," 3 Ed. I. (Rot. Hund. I. 404). "Fowle lane or Chickine lann," 1546-1617 (Trans. L. and M. Arch. Soc. V. 421). "Butcher Hall Lane" (Stow, ed. 1633-Elmes, 1831). In Horwood the northern portion into Little Britain is called "Blue Coat Buildings," and in Rocque "New Passage." In these maps and in O. and M. "Butcher Hall Lane" ends at "Bull and Mouth Street." Called "Butcher Hall lane" as having the Butchers' Hall in it. "Stinking lane" on account of the smell of the slain carcasses. Excavations made for building in 1842 revealed that the site had at one time been used as a Roman burial place and must at that period have been outside the City walls. Named after King Edward VI. in commemoration of his interest in Christ's Hospital. From: 'Katones Lane - King Street', A Dictionary of London (1918). URL: http://www.british-history.ac.uk/report.aspx?compid=63189 Date accessed: 18 December 2010. ^ Bradley/Pevsner, London: The City Churches p. 53. This page was last modified on 21 December 2010, at 16:26.